Take-home message: The subiculum is in a pivotal position governing the output of the hippocampal formation. Despite this, it is a rather under-explored and sometimes ignored structure. Here, we discuss recent data indicating that the subiculum participates in a wide range of neurocognitive functions and processes. More research required! Prog Neuropsychopharmacol Biol Psychiatry. 2009 Aug 1;33(5):782-90. doi: 10.1016/j.pnpbp.2009.03.040. Epub 2009 Apr 22. O’Mara SM, Sanchez-Vives MV, Brotons-Mas JR, O’Hare E.
Trinity College Institute of Neuroscience and School of Psychology, Trinity College-University of Dublin, Dublin 2, Ireland. 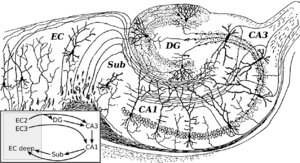 The subiculum is in a pivotal position governing the output of the hippocampal formation. Despite this, it is a rather under-explored and sometimes ignored structure. Here, we discuss recent data indicating that the subiculum participates in a wide range of neurocognitive functions and processes. Some of the functions of subiculum are relatively well-known-these include providing a relatively coarse representation of space and participating in, and supporting certain aspects of, memory (particularly in the dynamic bridging of temporal intervals). The subiculum also participates in a wide variety of other neurocognitive functions too, however. Much less well-known are roles for the subiculum, and particularly the ventral subiculum, in the response to fear, stress and anxiety, and in the generation of motivated behaviour (particularly the behaviour that underlies drug addiction and the response to reward). There is an emerging suggestion that the subiculum participates in the temporal control of behaviour. It is notable that these latter findings have emerged from a consideration of instrumental behaviour using operant techniques; it may well be the case that the use of the watermaze or similar spatial tasks to assess subicular function (on the presumption that its functions are very similar to the hippocampus proper) has obscured rather than revealed neurocognitive functions of subiculum. The anatomy of subiculum suggests it participates in a rather subtle fashion in a very broad range of functions, rather than in a relatively more isolated fashion in a narrower range of functions, as might be the case for “earlier” components of hippocampal circuitry, such as the CA1 and CA3 subfields. Overall, there appears to a strong dorso-ventral segregation of function within subiculum, with the dorsal subiculum relatively more concerned with space and memory, and the ventral hippocampus concerned with stress, anxiety and reward. Finally, it may be the case that the whole subiculum participates in the temporal control of reinforced behaviour, although further experimentation is required to clarify this hypothesis.